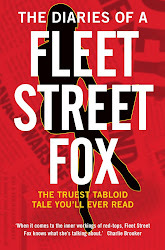 fleet street fox: Good ol' Grub Street. THERE are two stories dominating the news today - the Leveson inquiry into the behaviour of the Press, and the trial into the racist murder of Stephen Lawrence 18 years ago. The two are entirely unlinked except for the fact they both hinge on the tabloids. If it were not for the worst excesses of - so far - five employees at the Screws of the World there would be no phone-hacking scandal, no closure of that newspaper, and no inquiry into whether and how to clean up Grub Street. 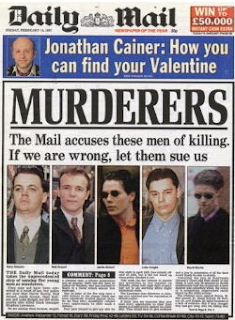 And if it were not for the same tabloid Press there is every chance Stephen's family would not now be sitting in a court watching the trial of two of the five men who have long been thought to have have murdered him. In both cases there are many other factors that brought us here - someone leaving the evidence to be found, promotion of people without a moral compass to roles that need one, police failures and forensic experts finding things they'd once overlooked. And where one is an appalling example of people acting beyond their powers for stories that weren't worth it, and traducing the reputation of the profession I love, the other is something to be proud of. It was brilliant journalism, because it hit every single target the tabloid press has to. It caught, perfectly, the prevailing mood of the nation. It summed up a complicated story in one word. It sold in its millions. And there was no chance they would ever be sued for it, because to do so would have led to those men probably being found culpable of murder in a civil court. It was a brilliant flourish, and the effect was to reignite a scandal which was fading. It led to a public inquiry and a continued police investigation which is what has led us back to court this week after a re-examination of the forensic evidence. That's why it was brilliant. Had The Groaner done it, around 200,000-odd city-based readers would have thought 'you can't say that! ', so they'd never have had the guts. The same goes for the rest of the snoresheets, because they don't have the same weight as a paper which sells. Any of the tabloids could have made that stand, but only one did. In the next few weeks and months those same tabloids - many of whose reporters had their phones hacked by Glenn Mulcaire, but none of whom have yet been found to have employed his services or his tactics - are defending themselves in front of Lord Leveson. Everyone is against us, and lots of things which are supposition are being presented as fact. No-one speaks in praise of us, but then no-one ever does. It doesn't matter much, because a good tabloid doesn't need friends.